The Lada class diesel-electric submarines are designed for anti-submarine warfare and anti-surface warfare, defence of naval bases and sea lanes, as well as for reconnaissance. The Rubin bureau is willing to modify the export version’s basic design to meet the requirements of the Indian Navy. Yury Dolgoruky, the lead ship of Project 955’s borey class is already in the Russian Navy, and the serial ships Alexander Nevsky and Vladimir Monomakh are scheduled for delivery at the end of the year. The Russian Navy, however, also needs a certain number of other ships of various classes, including non-nuclear submarines. Within the framework of the state armament program, there are plans to build twenty diesel-electric submarines by the year 2020. Six of them will are Varshavyanka Projects 636.3 vessels and the remaining 14 are the modified Lada Project 677 ships. The fourth generation submarine Lada, developed by the Rubin Design Bureau is the embodiment of the vast experience gained from the development and improvement of the second and third generation submarines, which have become best-sellers in the global naval armament market. The design and capabilities of the non-nuclear ships allow them to be used both in coastal and offshore waters, including the Baltic and the Black Sea. The Lada submarines are not only able to defend the naval base and the coast, but also to explore and destroy the enemy’s submarines and surface ships. The development of the Lada project was launched in the mid- 1980s. The first technical project was approved in 1993, and the final, with a significant increase in the basic performance characteristics - in 1997. Foreign countries are showing an increased level of attention to the Rubin-designed boats. There was great interest in the LIMA 2013 exhibition in Malaysia, which traditionally brings together representatives of many countries in the Asia-Pacific region. 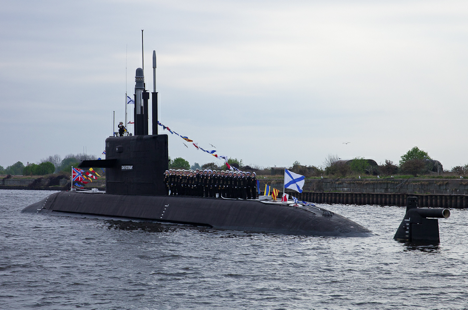 The region is expected to account for more than half the sales of non-nuclear submarines in 2030. This is largely due to the fact that the Lada and its export modifications Amur have a significant advantage over their European competitors - they are able to deliver volley missile strikes. A fully automatic rocket has been applied on the Lada – a torpedo complex with an unprecedented striking power for a ship with such displacement. Lada vessels are single-hulled, with minimal displacement allowing for reduced noise signature and improved propulsion quality. The class marks the first usage of the Russian navy of a mono-hull design since the 1940s. According to chief designer Igor Molchanov, the Lada’s design greatly reduces its displacement, requires less metal, which entails a lower production cost, and also improves the acoustic performance and makes the submarine less noticeable. Molchanov says the fourth generation submarine has a number of fundamental differences from vessels of the third generation. First of all, the new submarine has a more powerful missile-torpedo armament. While cruise missiles can only be used from two torpedo tubes on the Varshavyanka, on the larger export-version of the Lada, the Amur-1650, cruise missiles can be used from all from all six tubes. In addition, the Amur-1650 features a low intrinsic noise level. Finally, compared to the Varshavyanka, the Amur-1650 has a greater cruising range in the underwater economic mode. The vessel has a general service life of at least 25 years. The Lada also has the Lira, a modern sonar complex with antenna systems, which in their surface area equate to those used on nuclear submarines. The ship’s vital functions provide a comprehensive automated system for controlling the Lithium combat and technical equipment – it manages its energy, as well as all the functions associated with combat weapons. The lead Project 677 ship, called St. Petersburg was built by JSC Admiralteyskiye Verfi. The first factory operation tests took place in 2006. In the four years of testing, the boat has gone out into the sea more than ten times with a total duration of about one year. After it had been transferred to the navy in May 2010, the ship participated in several exercises of the Baltic Fleet. The Lada class vessels also have tremendous potential for further upgradation, especially when it comes to its electronic equipment. The project has satisfied the necessary condition of providing an open architecture for upgrading electronic systems. The Rubin Design Bureau is also willing to modify its new vessel’s basic design to suit customer-specific requirements. Potential buyers like India have taken a keen interest in submarines with air-independent propulsion. The bureau is looking to manufacture an appropriate version of the Amur-1650 that would satisfy the requirements of the Indian Navy. India is on the lookout for a submarine that would allow hydrogen to be produced directly on the boat by reforming diesel. First published in Russian in VPK.